Want a pool? No problem. How about a hot tub? Can do! Rocking chairs, pool table, fireplace, game room, big-screen TV? Got it! Smokies cabin rentals have something for every taste, occasion and budget. Whether you want to lose all sense of time in a rustic cabin with stunning views, or you want a home away from home including all life&apos;s luxuries – with stunning views! – you can have it in the Great Smoky Mountains. The best way to narrow down your choices is to imagine your perfect vacation. Who&apos;s going? Celebrate an anniversary quietly with a cozy one-bedroom cabin. Go to sleep in front of the fire and wake to coffee and crisp mountain air on the porch. If you&apos;d like to have a special dinner at one of the area&apos;s many excellent restaurants, go ahead and make a reservation. Most cabin rentals are secluded enough to be peaceful but close enough to be convenient. Family vacation? The majority of cabin rentals are near fun family activities such as the aquarium, Dollywood theme and waterpark, zip lining and more. Rent a cabin with bunk beds or one large enough that everyone has their own room. Smoky Mountain cabin rentals are affordable enough that you have plenty of options. What do you want to see and do while in the Smokies? Choosing a cabin near those activities and attractions can be a prime decision-making factor. Gatlinburg is at the entrance to Great Smoky Mountains National Park. This quaint small town with restaurants, shopping, history, arts, crafts and attractions is a big draw for visitors. If you like busy vacations, or just want options, choose a cabin near this popular mountain resort. Pigeon Forge is the home of Dollywood, the epicenter of festivals and thrill-ride fun. There&apos;s so much to do (and eat) in Pigeon Forge that it has become quite popular over the last decade for its natural beauty, events and central location. Wear&apos;s Valley is an excellent choice if you prefer to have a little distance between you and all the action. This area has many budget-friendly and upscale options for couples and families alike. Wear&apos;s Valley cabins are located near shopping, restaurants, music venues and adventure outfitters for fishing, rafting, horseback riding, zip lining and more. Pining for a mountain view or a water view? Smoky Mountain cabin rental companies offer both. 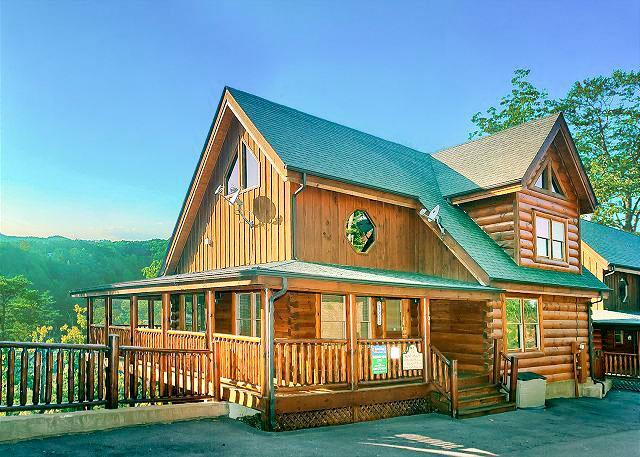 Check out Aunt Bug&apos;s Cabin Rentals in Pigeon Forge and Gatlinburg for cabins that feature a view of the Smokies or a view of the river (or both). When you&apos;re this close to nature, you can go fishing or tubing in the gentle Little Pigeon River or ride the raging Big Pigeon River on a raft during the day, then retreat to your mountain home for burgers on the grill at sunset and a rousing game of pool or movies on the big-screen TV in the evening. Looking for luxury? Companies like Alpine Mountain Chalets rent one- to five-bedroom cabins in Sevierville, Pigeon Forge and Gatlinburg. Many of these secluded cabins feature amenities like pools, sunset decks, luxurious bathtubs and outdoor kitchens. The area&apos;s large chalets are truly amazing. These light-filled two-story cabins easily accommodate large families or multiple couples and feature gourmet kitchens, plush leather furniture and to-die-for vistas. To maximize the fun factor, ask for a cabin with a theater room and an outdoor fire pit. Don&apos;t forget the popcorn and s&apos;mores! Vacationing in the Smokies is about being together, and for some families being together includes the dogs. If your dog is part of the family, many cabin rentals offer pet-friendly accommodations. There&apos;s usually a small fee and some have a weight or breed restriction. Whether you&apos;re dreaming of a rustic retreat or a luxury vacation, cabin rentals in the Great Smoky Mountains have something for everyone. Go ahead and imagine your dream vacation – a quick search will turn up the perfect property. Be sure to pack your hiking shoes and swimsuit for adventures in between naps!